One of the good things about having a blog is that you can write your letter to Santa and post it online so, maybe, there are more chances he reads it...LOL !. I've been a good girl finally. I have maybe spent too much money over shoes and make up items...but you know I can't help it ! I have been dealing with some fickle friends, being efficient even when things were hectic at work...I haven't been going out much during the week, therefore I deserved the attention I gave myself !. Usually when I wanna free myself from guilt when buying something expensive, I go out and look for something really expensive so that my purchase seems almost cheap, lol, does it make any sense to you ? This only my first part of my wish list...you'll be reading more before Christmas arrives and mind you, I will be happy even with cheaper items...see how good am I ?!. Rachel Zoe Ali cape...wonderful ! 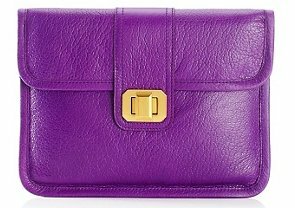 Balenciaga City bag...purple leather :) luxury ! 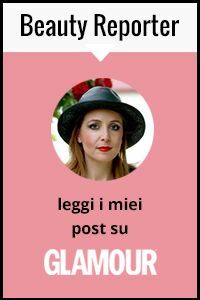 Uno dei vantaggi dell'avere un blog è poter scrivere la propria letterina a Babbo Natale e postarla online avendo, magari, più chances che lui la possa leggere ;-). Siete già in umore natalizio ? Io non completamente...ad esempio, non ho ancora decorato casa, ma ho già qualcosa da dire a Babbo Natale (o a chi ne fa le veci, LOL). in fondo sono stata una brava ragazza. Forse ho speso troppi soldi in scarpe e trucchi...ma lo sai che non riesco a resistere ! Ho dovuto sopportare alcune amicizie volubili, ho resistito anche allo stress sul lavoro...non sono uscita molto durante la settimana, pertanto credo di avere meritato le attenzioni che mi sono concessa !. Di solito una delle tecniche che adopero quando voglio comprare qualcosa di costoso è puntare qualcosa di ancora più costoso e inaccessibile, in modo da sentirmi meno in colpa per l'acquisto fatto. Ha un senso per voi ?. Ecco, quindi, una prima lista (ce ne saranno altre) di "regalini" che mi piacerebbe ricevere a Natale, tenete conto che sono disposta ad accettare anche oggetti di minor valore, hehehe...vedete quanto sono brava ? ;-). Gostei dessa proposta em escrever ao Papai i Noel. A bolsa e o sapato preto é lindíssimo. Adorei. Beijos e ótima semana. That CAPE! It's so freakin' cute. Beautiful wishlist!I adore the purple balenciaga and the cape. Good idea. I'd like to write Santa online too. I love the leather case - perfect color! anch'io voglio scrivere per avere tanti presenti..sopratutto scarpe e borse hihi..baci cara!! The Louboutins are the best. LOVE! The truth is that I would ask you all, but I'll Louboutin shoes and Rachel Zoe layer Ali. 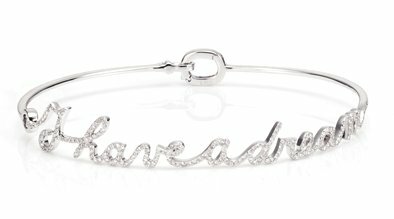 That bracelet is so dreamy.. I have made a list of my own, if you'd like to check it out. I probably will have just socks for Christmas... but it's not important! It's a big holiday... I mean it's Christmas! Hi dear, thanks for your sweet comment and for following, I´m also following you. Wonderful wish list & inspiration! I love them all! Olha eu amei essa bolsa, que cor linda! The cape and the pumps are to die for! great christmas list!!! it's a good idea to put your list up online ;) hope you get some of your items on your list! Maybe I'll tell Santa to check my wishlist here! The cape and the bag are gorgeous! Love it! Can I have it in my wish list too? I love your letter to santa! i adore the shoes, the bracelet and the cape all gorgeous! Se Papai Noel me presenteasse essa Balenciaga,ja estava de bom tamanho. Bacio.!! Great post as usual and I love those Louboutins, incredible. Ehhh bhé come darti torto! I've definitely played the cheap by comparison card when I'm trying to get over shopping guilt. It works like a charm. I love that Juicy iPad case! It looks like a chic clutch. And that Rachel Zoe cape is gorgeous. io da questa postazioen non vedo le foto... però penso che la tua filosofia di fondo sia ottima! it's nice dear :] anyway, I cant see your background. there are many words said about 'Domain unregistered. To view, register at blablabla' would you gimme the reason? kisses. lusting over all of your choices...hope you get them all!!!! That cape. I WANT THAT CAPE!!!! Che belle scarpe ottima scelta! Un bacio! Such an awesome wishlist... I totally want everything on it! Especially the cape and the bracelet! I really enjoined this post!!! I want balenciaga city bag!!! 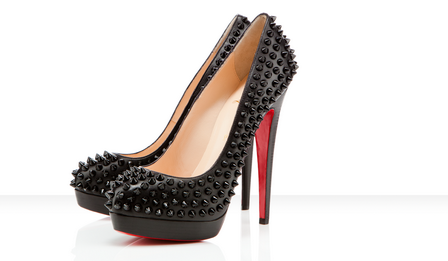 oh, a pair of sky high Louboutins would be a great gift from santa claaaus! love the purple handbag!!santa?? ?can i have it too??? You've got high aspirations with those pumps! They'll be so expensive. They look great thought the studded detail is really eye-catching ! let me know if you find it now..
Io Voglio il borso di Balengiaga i la jacket de Rachel Zoe! Il braceletti anche e meraviglioso!! I hope Santa listens to you. I would settle for the Balenciaga bag:) I'm also a fashionista and my daughter is a shopaholic. I'm following you from Rome, Italy! Yes sweety, I'm there, I'm the fifth photo! ;) Check again! OMG! I love the balenciaga bag!!! I like so much this Balenciaga bag!and Louboutin pumps are amazing. Adoro ogni elemento in questa lista *_* le Louboutin sono fantastiche! Ne ho un paio che comprai circa un anno fa per un matrimonio (modello diverso da quello della foto) e le amo! This is such a fab list! Love the Louboutins! I LOVE that diamond bracelet and those shoes!!! Nice blog entry!!! grazie di essere passata nel mio spazio. Sono anch'io più amante di Coccinelle che si Tosca Blu ma visto che vorrei prendere sia una borsa da sera sia una da giorno dorò decidere per una da sera meno costosa, anche se adoro quella di Coccinelle.